Today is Deori Bihu or traditionally called ‘Ebaku Bishu’. The Deori community of Assam celebrate this spring festival on the first Wednesday of ‘Bohag’, the first month of Assamese calendar. The festivities are related to the agricultural cycle, and Deoris being an agrarian people, enjoy the festivities with unrestricted joy and enthusiasm. According to local folk belief, the first Wednesday of the Bohag month is a sacred day. 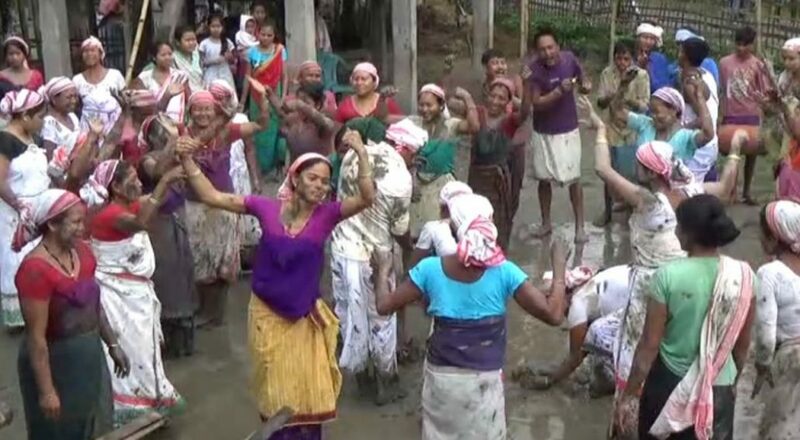 Majuli, the river island district of Assam on Wednesday wore a festive look as residents of the villages like Major Deori, Bali Deori and Sriram Deori are celebrating ‘Ebaku Bishu’ with traditional fervour and gaiety. The elders offer obeisance to the departed souls to begin the rituals of the day. The rituals started with a puja at the Deughar, a community prayer hall, followed by animal sacrifice. In the morning, usually a goat is sacrificed at the alter of Goddess Kechaikhati for the welfare of the community. People of the community also offer sacrifices of ducks and fowls individually for the welfare of their families. Later the people of the community visit each other and offer greetings while exchanging traditional dishes and beverages. The ladies of the community indulge in egg fight and mud game during the day. Young ones will smear mud on each other and indulge in the revelry. According to traditions, young boys who have just stepped into their teenage are made to wear ‘churia’, a traditional attire on this day symbolizing that they have become youth. The young people hold ‘husori’ and perform Bihu dance in the courtyard of every households. One of the main attractions of the first day of the Bihu is the prophecy made by the ‘Deu’, who performs ‘Deudhoni Nritya’ and forecasts the future of the village for the year.